The last of the blackberry flowers are fading, and I didn’t see many bees visiting the berry patch on my run by them today. I guess that means the blackberry honey flow is almost over. The Jaimes really took advantage of the flow and filled the entire 4th hive body with 8 frames of honey. That means they’ve made about 40 pounds of honey in a week! I was pretty shocked when I discovered that today, as it’s only been about a week since I added that box. I need to stop by Ballard Bees tomorrow and buy more hive body boxes and frames. The Shuras, on the other hand, haven’t even started on their 4th box, though they have completed the three brood boxes and are busy stashing away pollen and honey in those boxes, and there are brood. I saw Queen Shura today so I know she’s alive and well. It’s interesting to me how far behind they are from the Jaimes. It’s hard to believe it’s only the 3-day head start the Jaime hive had on the Shuras and makes me wonder what else is at play. In other news, there are indeed ZomBees; I have evidence now to show it. The bees that I caught in my light trap have produced zombie fly pupae. Ug. 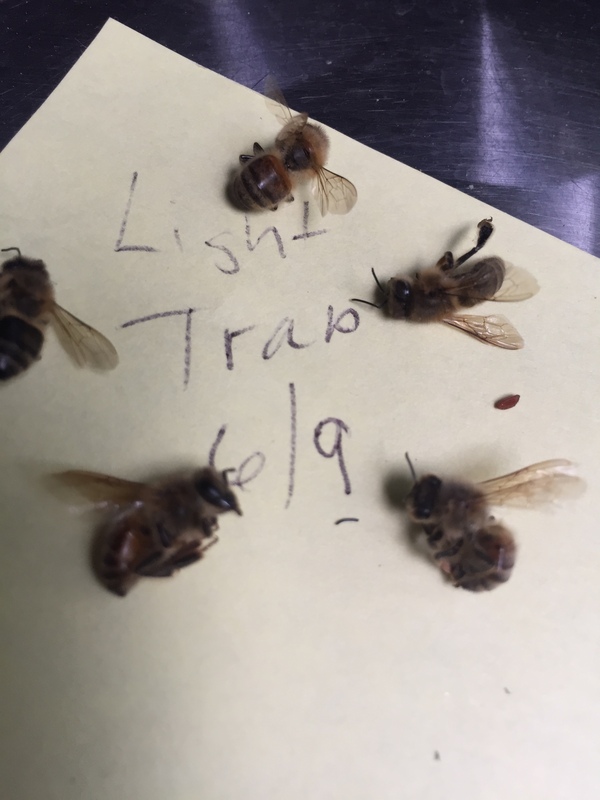 Interestingly, the bees that were stranded in the yard (not caught with a light trap) in this video haven’t produced pupae. So they may have been sick/weak from something else. I’ll continue to monitor those samples and probably take more samples in the future. It’s definitely interesting caring for these complicated creatures! I hate to admit how fascinating your bee blogging is. Next Next post: First Jar of Sweet Jaime Honey!